The recording engineers provide a realistic aural perspective. The multichannel format places the listener within mid-orchestra seating. Each orchestral choir is distinctly heard even during the loudest of tuttis. (...) Highly recommended! Superbly recorded coupling of the new with the old from the Finnish master. The performances, typical of this series, are absolutely first class. (...) Manhattan Trilogy is certainly ravishing, but the Symphony really deserves to enter the repertoire of orchestras the world-over. And if you love Bruckner, even a little, you must hear it. This CD/SACD hybrid recording is dedicated to Einojuhani Rautavaara - internationally one of the best known and most frequently performed Finnish composers, who celebrates his 80th birthday in 2008. 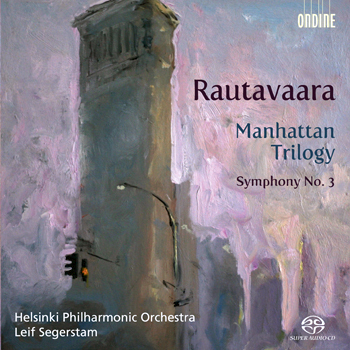 The world première recording of Manhattan Trilogy is coupled with the Third Symphony, performed by the Helsinki Philharmonic Orchestra under the direction of its chief conductor Leif Segerstam. Commissioned by the Juilliard School for its centenary celebrations in 2005, Manhattan Trilogy is a reminiscence of the American student years of the "patriarch of contemporary Finnish composers" (The New York Times). A scholarship granted by no less than Jean Sibelius had enabled Rautavaara to study at Juilliard and in Tanglewood in 1955 and '56. The three movements are powerful musical recollections on moods from this time (Daydreams, Nightmares, Dawn). Following its world première at Carnegie Hall, the New York Times marveled at the work’s "achingly beautiful solo lines darting through the thick textures." It has often been said that Rautavaara's heroic Third Symphony, written after his student years in 1961, almost sounds like Bruckner. "The four movements breathe in a solemn, Brucknerian swelling – akin to the rhythm of the land and the sea," as Rautavaara writes in the booklet liner notes. The Helsinki Philharmonic Orchestra and Leif Segerstam build on their long-time pedigrees of performing their compatriot’s music and deliver here a fresh performance recorded in super audio quality. This new release follows on the boom-like success of Ondine's releases featuring the Finnish cult composer since the mid-1990's. The recording of Rautavaara’s breakthrough work, Angel of Light (Symphony No. 7), won a Cannes Classical Award, as well as a Grammy Awards nomination in 1997 (ODE 869-2). One year later The Violin Concerto likewise received the Cannes Classical Award in 1998 (ODE 881-2).